France's Camille Abilly looks on as Japan celebrates their victory at the end of their women's football semi final Japan vs France event at Wembley stadium during the London 2012 Olympic Games on Aug. 6, in London. Japan won 2-1. France's Camille Abilly is consoled by a player from Japan after Japan defeated France in the women's semi-final soccer match at Wembley Stadium in London at the London Olympic Games, on Aug. 6. Japan's Aya Miyama chats with dejected France player Camille Abilly at the end of their women's football semi final Japan vs France event at Wembley stadium during the London 2012 Olympic Games on Aug. 6, in London. It is not often you see players of opposing teams going out of their way to console one another after a game has ended. Their interaction is usually limited to a friendly handshake or pat on the back. These images of Japan's Aya Miyama comforting France's Camille Abilly, after Japan defeated France 2-1 in a close semi-final match, stood out from other post-game reaction photos. While we have no way of knowing what words were exchanged between the players (and we can only assume there was a bit of a language barrier between them), their body language speaks for itself. It is clear Miyama took time to try and comfort the distraught Abilly, and Abilly seems to eventually accept her kind gesture. In such intense competitions, where emotions run high with adrenaline, it is reassuring to know that these Olympians are not only extraordinary athletes, but show true sportsmanship as well. 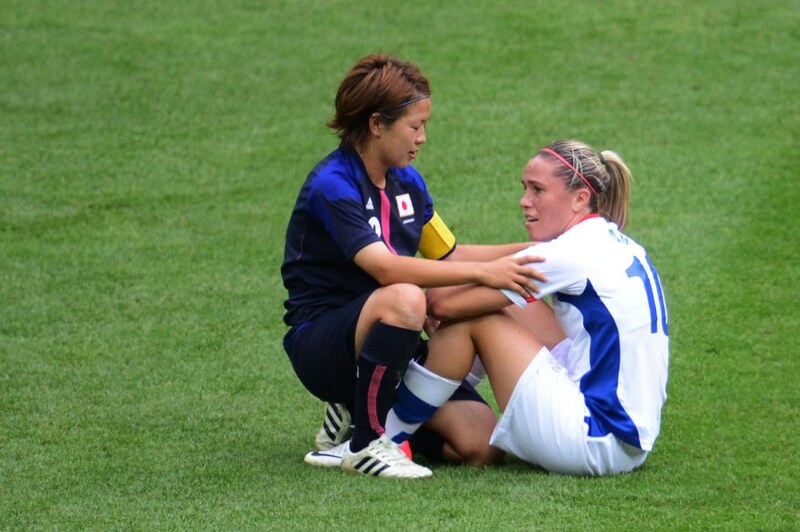 Editor's note: This post has been updated to correctly identify the Japanese player consoling France's Abilly. It is actually midfielder Aya Miyama, not Azusa Iwashimizu. France's Camille Abilly is consoled by Japan's Aya Miyama, after Japan defeated France in the women's semi-final soccer match at Wembley Stadium in London at the London Olympic Games, on Aug. 6.